Welcome back to In Focus feature. This is Gayatri. This month we are focusing on Winnie & Walter’s Creative Screenings aka stencils. There are so many different ways to use a stencil. 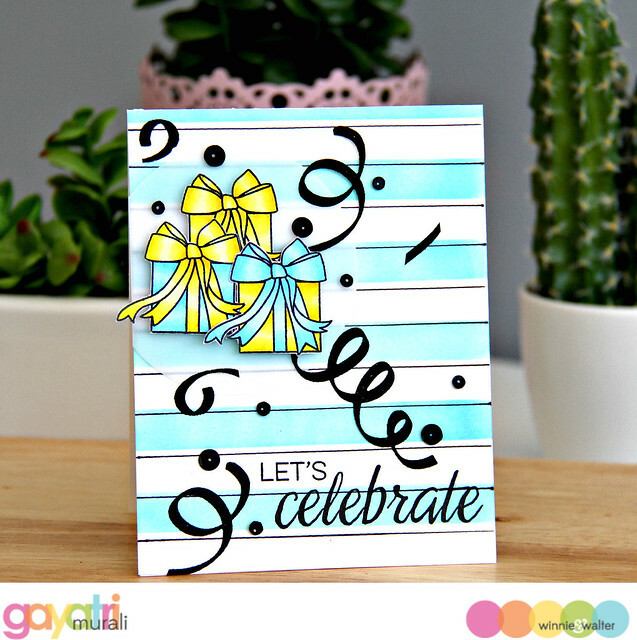 You can use embossing paste, sponge ink, watercolour, spray inks to name a few. I am focusing on sponging ink technique. It is the simple yet gives a huge impact on your card. In style #1, I am using the sponging ink technique and add a little something more to create your own background for your card. However, I am not using distress inks and blending. But I am using pigment inks. I love pigment inks for one good reason. Unlike dye ink, these inks sit on top of the cardstock and therefore the colours are bright and vibrant. I also like the subtle raised effect they give because of this property. First, here is my finished card. 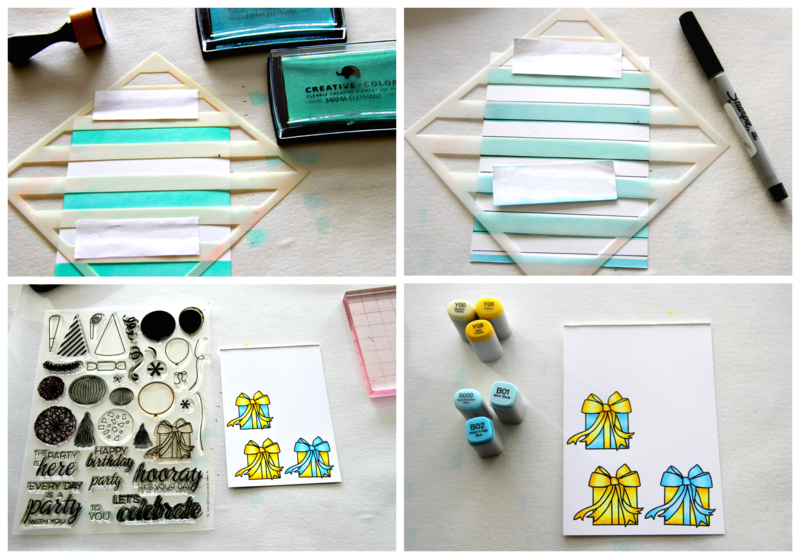 Here are the photos of how I made my background for this card using Scenery: Classic Diagonal Creative Screenings from Winnie & Walter. I have used the Classic Diagonal Creative Screenings horizontally by just rotating the stencil. I sponged two hues of blue pigment inks alternatively. This added to some visual interest instead of a single colour. Once I sponged the inks, I left them to dry for couple of minutes. Of course you can use the heat gun to dry the inks. Then I placed the stencil back on the card front but this time I slightly offset the stencil above the sponged area. I used a black fine tip pen to draw the lines both on top and bottom of each stripes. 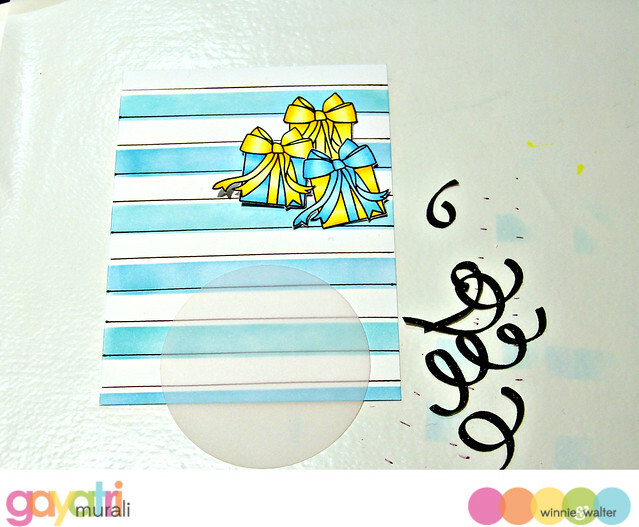 The black lines added contrast and offsetting added more visual interest to the background of the card. For the focal element, I stamped three gift boxes and coloured them with copic markers. 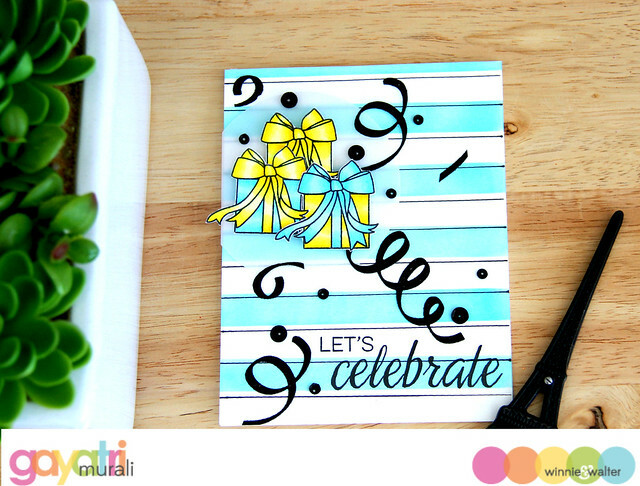 This gift box image is from The Party stamp set from Winnie & Walter. Here I brought in a third colour – yellow which beautifully contrasts the blues and black. I cut those gift boxes out, then die cut a vellum circle. To tie in all the colours together, I needed a bit more black elements. I die cut a few confetti from the The Party Confetti Cutaway using black glitter paper. I then layered and glued the gift boxes using foam adhesives on the vellum circle, adhered the vellum circle to the card front at the top left slightly offset. Trimmed the excess of the circle. I then stamped the sentiment also from The Party stamp set in black ink on the bottom right to balance the elements on the card. Finally scattered and adhered the confetti. I also added some Onyx sequins from Pretty Pink Posh. Here are some more pictures of the card. So hope you try out this simple sponging technique using Winnie & Walter’s Creative Screenings. Give a bit of interest by adding a few different hues of the same colour or just different colours or by drawing around the stencil. Link up you projects to the linky. One of the entries will be highlighted in social media. Very beautiful, Gayatri! LOve the blues and yellow! Beautiful card. Thank you for sharing your techniques. When a pretty vibrant card ! This is so pretty, l love anything with stripes and the addition of the black lines looks great! WONDERFUL card with amazingly cool details and just so many things to love about it - my favorites are the black offset lines by the colored stencil lines and the yummy circle of vellum behind the presents - SO LOVELY!!! Such a vibrant and festive card! Love it! 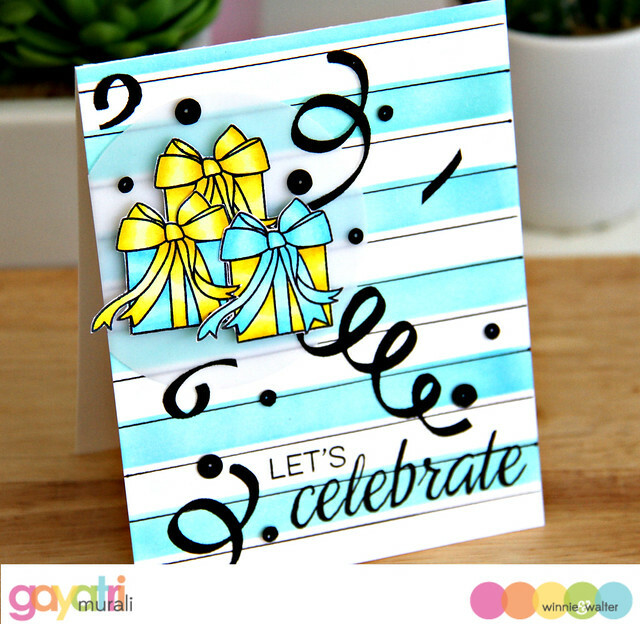 BOLD & BEAUTIFUL card Gayatri - LOVE IT ALL!! !